By helping children to take good care of their teeth, you are starting habits that will last them all their lives. 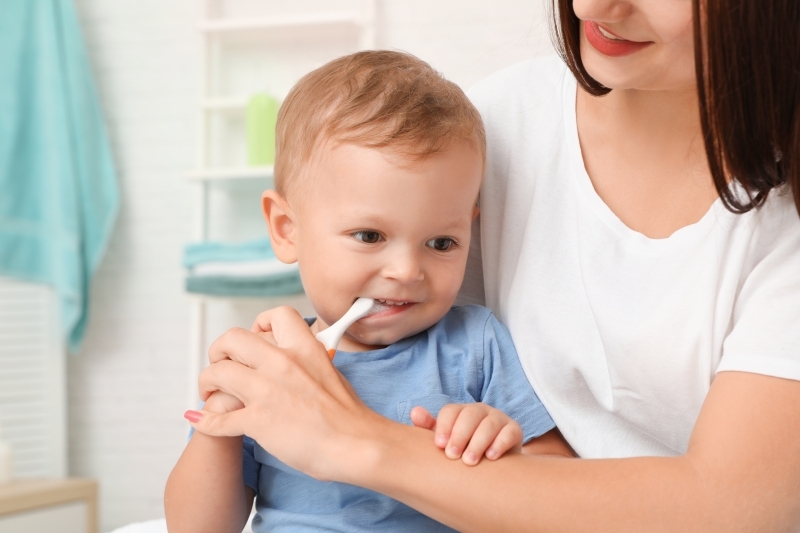 Here, our children's dentists share some information about how to care for your little one’s oral health during the early years. When a baby is born, the first set of teeth (commonly referred to as baby teeth) is already there, just under the gums. The front teeth usually begin to come through the gums between six and twelve months. Over the next 2 years the remaining baby teeth will appear, and by the time a child is 3 years old all 20 baby teeth should have arrived. These teeth are very important for eating and talking, and they also keep spaces for adult teeth. Good, healthy baby teeth will pave the way for good healthy adult teeth, so it’s important to make your child's oral health a priority. Even before you see any teeth, always clean your baby's gums after a feeding. Wrap a wet washcloth around your index finger and gently massage the gums. Once your child’s first tooth comes in, start to use a child's soft bristled toothbrush, with a small smear of child-safe toothpaste. Once the child reaches age 2, a larger, pea-sized dab of toothpaste is recommended. You can also start flossing as soon as they have two teeth next to one another. Your child should have an exam by a dentist by their first birthday or within 6 months after their first tooth comes in. Not only will this give your dentist a chance to identify any oral health issues early, it will help get your child get comfortable with the idea of visiting the dentist regularly. Infants normally begin teething between four and six months of age. Their gums may be red and swollen and you may notice lots of drool. To ease these symptoms, give your infant a clean teething ring or cold wet washcloth. Their discomfort will pass. Having sugary foods and drinks too often puts teeth at risk of tooth decay. For good oral health, cut down on how often your child eats sugary foods and drinks. It is also important never to give sweet drinks in a baby bottle, and try not to let your baby develop the habit of sleeping with a bottle at night or at nap time. If you baby or child does have something sugary, be sure to clean or brush their teeth thoroughly afterwards. You can help your kids have a healthy smile by making dental hygiene fun. Make brushing and flossing a family activity, or create a reward system to encourage positive behaviours. Watch an episode of their favourite show about visiting the dentist, or look for books at your local library about oral health for kids. Whatever you decide to do, you can help them start good habits that will last them a lifetime. To learn more about early oral health, or to schedule an appointment for your child, contact our children's dentists in Burnaby.